after for various uses; some people like to use coconut water, Coconut oil, coconut chips, Coconut milk for cooking or baking. One important aspect of the coconut is the coconut oil. If you want your hair to grow faster, coconut oil is amazing for more rapid hair growth. The vitamins and essential fatty acids found in the coconut oil nourishes the scalp and help to remove sebum build-up from hair follicles. Use as a hot oil treatment. Warm up 3-4 tablespoons of coconut oil massage into your scalp to help with blood circulation. Wrap your hair with shower cap and cloth and leave overnight for best results. Wash your hair the next morning and style. Do this 2-4 times a week. Don't underestimate using coconut oil for hair growth. Coconut oil is excellent for removing eye makeup, even the most stubborn waterproof mascara. Just warm a tablespoon full of coconut oil, dip with a cotton ball and gently wipe your makeup, rinse with warm water. Yes, you can use coconut oil for face; remember oil cancels out oil. Yes, coconut oil is an amazing and natural way to kill those pesky bacteria in our mouth. This method is called oil pulling. Oil pulling is an ancient way of cleaning the mouth. Coconut oil is efficient because of its detoxification procedure that you can simply do by swishing a tablespoon of oil in your mouth for 10-20 minutes. By swishing with the oil, bacteria and toxins are absorbed by the oil. Do not swallow, spit out and brush as you normally would. 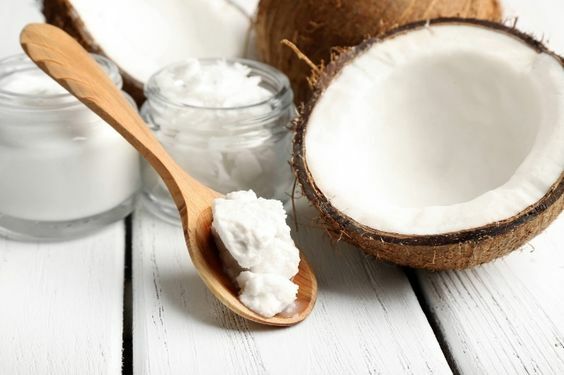 It is vital to tp use virgin coconut oil for oil pulling. Add one tablespoon of coconut oil into your coffee to instantly add sweetness and flavor. Combine a cup of liquified coconut oil with your favorite essential oil such as lavender, pour oils into a plastic bottle and shake well. This oil mixture can be used as a skin moisturizer or as a massage oil. Just apply coconut oil to your sunburn for relief. Apply as often as needed. This is an excellent benefit of coconut oil. Combine two tablespoon of brown sugar with half cup of coconut oil and gently exfoliate your skin, apply in circular motion. Rinse with warm water, pat dry with a clean towel and apply your favorite moisturizer. Combine one tablespoon coconut oil, one tablespoon Vitamin E, one drop of lavender oil. Pour into a clean mascara tube. Apply oil to lashes one to three times daily. Apply coconut oil to your lips as needed to create smooth, soft, and moisturized lips. Rub a small amount of coconut oil beneath your eyes to help reduce the look of dark circles. As you can see, there are numerous beauty uses of coconut oil. Do you use coconut oil for your hair or skin? I always used to use coconut oil on my hair, it made it feel amazing! I don't know why I ever stopped! Coconut oil is one of the best oils for hair. I still use mine mixed with argan oil. My hair loves it. I always use coconut oil as a makeup remover and I love it! Will start trying to implement the other ways of usage too. Thanks for sharing! Brilliant tips thanks for sharing.I burn quite easy in the sun and just preparing for my newyear vacation to the sun,beach and fun,knowing something as simple as coconut oil can help with sunburn is great. You are welcome! I love the versatility of coconut oil.